A new foot and cycle bridge into the major Fletton Quays development has been promised by Peterborough City Council. The council’s new Local Plan has earmarked a campus for the new University of Peterborough just north of the Embankment, but crucially it states that any future development in that area has to include a foot and cycle bridge to Fletton Quays. The inclusion of the guarantee follows a Peterborough Telegraph campaign to ‘Build the Bridge’ which launched in July and received widespread support from city councillors. The Local Plan - which earmarks the future development of the city until 2036 - states that the new campus by Bishop’s Road could include: university faculty buildings, an administrative centre and general student amenities such as student accommodation and sports facilities.
. Protect views of the cathedral. 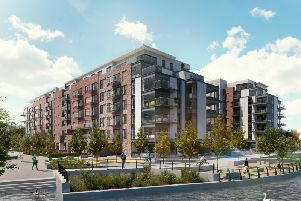 Fletton Quays is a £120 million redevelopment of the city’s South Bank - situated near the Peterborough United stadium - which includes 280 high-end flats, a 160 bed hotel, an arts centre and offices, as well as restaurant and retail facilities. A debate on a foot and cycle bridge from the Embankment to Fletton Quays was held by city councillors in August, with all members agreeing that the bridge would be of huge benefit to Peterborough. However, councillors stopped short of promising that the bridge would be built soon, with the ruling Conservatives highlighting immediate constraints on the council’s budget following government cuts to its grant. The University of Peterborough is due to open in 2022 and will eventually hold 12,500 students. Land north of the Embankment appears to have now beaten off other frontrunners as the chosen site for the major campus. Other contenders were North Westgate (north of Queensgate Shopping Centre) and Wellington Street Car Park in Eastgate. Putting the campus in land north of Castor has previously been considered but was later ruled out.